With privileged access to both the London’s National Gallery and Amsterdam’s Rijksmuseum during a major show, this film documents a landmark Rembrandt exhibition while interweaving his life story. Given exclusive, privileged access to both galleries, the film, through EOS - Exhibition on Screen - brilliantly documents this landmark exhibition whilst interweaving Rembrandt’s life story with behind-the-scenes preparations at these world famous institutions. The exhibition focuses on the highlights from the final years of Rembrandt’s life, commonly thought to be his finest years. The masterpieces he produced during this period could be called his defining works, with each piece so soulful and honest that they helped sculpt our idea of Rembrandt as a man and as an artist. This film explores each of the exhibition’s key works, through contributions from specially invited guests, including curators and leading art historians. Portrait of a Couple as Isaac and Rebecca, commonly known as The Jewish Bride, is a painter’s painting. According to his letters, Vincent van Gogh was reduced to tears in front of it, writing that he would gladly give up ten years of his life to sit in front of the painting for two weeks, eating only a stale crust of bread. Though modern viewers may require slightly more sustenance, the power of the image remains. In the center of a horizontally-oriented canvas, a woman in a luxurious red dress stands with her wrists and neck draped in pearls. Her companion stands to her right, one arm reaching behind her, the other reaching out to lay a hand at her breast. He is equally richly dressed in a vertically pleated garment over a shirt in shades of gold and brown. The fingers of her left hand gently rest on his in a touching, protective gesture. The two figures, despite the intimacy of their gesture, do not look at each other, nor do they look at the viewer. They are alone in this moment, set beside an arch and a potted plant barely indicated in shades of dark, mottled brown. For many, Rembrandt is the greatest artist who ever lived, and this film seeks to explore the truth about the man behind the legend. 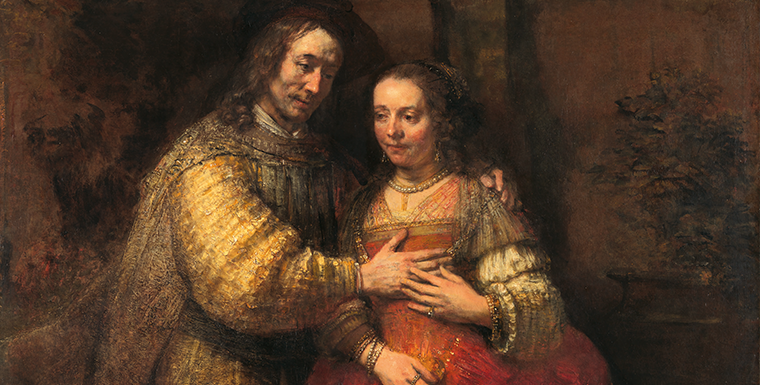 ​We may head to a nearby restaurant afterward to discuss Rembrandt, art, or whatever else is of interest. Click here to buy tickets!! !